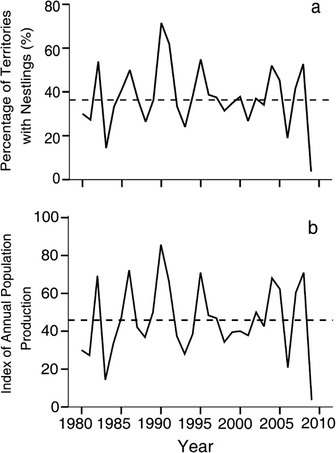 (a) Percentage of known Golden Eagle territories with nestlings, and (b) the index of annual population production in Västerbotten County, northern Sweden 1980–2009. The dashed line indicates the mean in each graph. Source: Moss et al. (2011) J Rap. Res. The number of snap-trapped voles (bank voles [Myodes glareolus] and field voles [Microtus agrestis]) in (a) spring and (b) autumn, 1980–2009 in Västerbotten County, northern Sweden, and (c) the pooled number of the principal prey species for the Golden Eagle, i.e., small game, mountain hare (Lepus timidus) and Tetraonidae species, as indexed by hunting bag statistics. The dashed line indicates the mean number of small game shot per hunting year throughout the study period. Source: Moss et al. (2011) J Rap. Res.